The interface of the disc, while not very good looking, is easy to navigate and definitely gets the job done. A main menu lets you choose which game you'd like to play. Then, if you choose a classic Genesis game, you are taken to a default menu screen for the emulator that will allow you change you controls and save and load games. Of course, you can only save and load games that allow saving and loading, such as the RPGs. And you'll of course need a VMU to save on, instead of the nice battery-backed cartridges from back in the day, but we can't have everything. While Vectorman has purty animation, the colors are, well, out to lunch. The first, and most annoying problem is the sound effects and music in the Genesis games. For some reason, the emulator garbles up the sound quite a bit. I noticed especially when playing Sonic the Hedgehog. If there is one music track from a game I'll always remember, it's the song from "Green Hill Zone." Anyway, when I first loaded up Sonic I thought the music was a bit garbled. I was pretty sure that it had lost pretty much all of the low-end of the mix. Yup, it's very tinny and there is very little bass. This was confirmed when I turned on my Genesis and listened to them side-by-side. It's actually pretty unfortunate. The sound effects, too, suffer a similar fate. Some sound very static-filled, other's are dead wrong and sound as if they've been replaced by general MIDI replacements. And unfortunately, this trait carries over to ever Genesis game on the disk. While it's not a devastating development, it is pretty annoying. Keep in mind though, that if you haven't experienced these games before, you're not likely to notice the difference in the sound quality. Another annoyance deals specifically with the games in the compilation. To me, I can understand why Golden Axe, Altered Beast, and Sonic the Hedgehog made the cut and were included on the compilation. But what about Wrestle War? Sure, the game is not bad, but why include it on the first compilation of Genesis classics. I can think of quite a few games that I would have added to the disk before Wrestle War. Why not Herzog Zwei? Or what about Mickey Mouse: Castle of Illusion? Or Aladdin? And sports fans really got the shaft. It was during the Genesis era that Sega Sports got their reputation. I'm not a sports fan myself, but leaving off Joe Montana's Football just seems like a bad idea. Anyway, maybe I'm just nitpicking, but it seems like the first compilation should have all been hits. I guess I also wish there were a few more games included on the disk. Twelve games is a start, but the Genesis library is huge. Twenty to thirty games per disk would shut me up real quick. But luckily, you can bet that Sega will release a few more of these puppies before long. Okay. This is too easy. Perhaps Wrestle War was better left in Japan with Cho Aniki? My final complaint deals with some of the arcade games on the disk. I understand that the Sega Smash Pack is supposed to be a Genesis compilation. 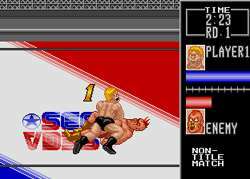 But it would have been really nice if Sega would have included the actual arcade ROMS of Altered Beast and Golden Axe. Sure, when these titles were released on the Genesis, they were graphical marvels. But it cannot be denied that they do look inferior to their arcade counterparts. 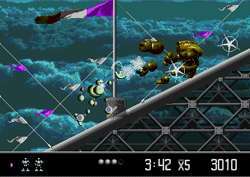 I supposed the inclusion of arcade ROMS would have required another emulator, but hey, it would have been nice to remember the games in all their glory. That said, Golden Axe and Altered Beast still retain all of the gameplay you remember, and that's what really counts. I suppose I should mention that it is possible that some "new-school" gamers may find nothing interesting on this disk. If you looking for big explosions, tons of polygons, and something to show off the power of your new Dreamcast console, the Sega Smash Pack: Volume 1 isn't for you. And this may be an important piece of information for some. If you're thinking about buying a Dreamcast and don't care for this disk, as it is described, then save the twenty dollars and just pick up the Dreamcast hardware. There are plenty of new games to play that are great as well. The first in the Sega Smash Pack line would be a very nice addition to anybody's Dreamcast library. Old-schoolers can relive the past, and newbies can get a taste of what once was. These are games that have stood up to the test of time and are still as fun to play today as they were ten years ago. There is so much gameplay in this disk, that it would really be a shame to miss it. Highs: Great collection of old classics from almost all genres, good interface, great emulation. Lows: Sound problems, not enough games, (give me more, Sega!) may not appeal to some gamers.